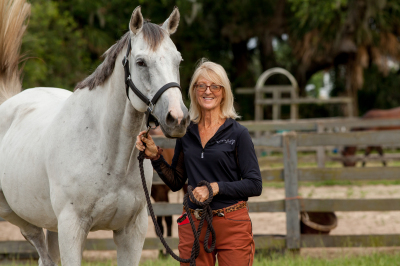 Second Wind Thoroughbred Project (SWTP) a 501c(3) corporation is the vision of life long horsewomen Dayle Eldredge who has been rehabilitating, retraining and reselling off-track Thoroughbreds for 35 years. Until the formation of SWTP Dayle has been doing this out-of-pocket, recieving weekly calls from people with needy Thoroghbreds and unable to take in more horses, she decided to form SWTP to continue her life long efforts to rehabilitate and rehome off-track Thoroughbreds. It is estimated that in 2015 over 22,000 Thoroughbreds will be born in the U.S. Of those 10% will never make it to the track and 25% will not be successful race horses. If they become injured or do not win enough when racing to cover their expenses, many owner's won't keep them. While some will become broodmares, approximately 1800 Thoroughbreds per year in just Marion County alone will face uncertain futures. With legislature forbidding the slaughter of horses for food in the U.S., some of these horses end up being abandoned and neglected. Our goal is to make a difference in the needs of Thoroughbreds after the track, to promote these horses, educate the comunity, and increase demand for Thoroughbred ex-race horses for second careers. This includes finding caring homes appropriate for each horse's needs whether retirement, pleasure riding, or competition. As a registered 501c(3) non profit organization, SWTP receives no public funding and relies 100% on charitable contributions from private donors. All donations, sponsorships, or grants are tax-deductible.